A Real Estate Marketing Flyer Makes A Positive And Lasting Impression! A Real Estate Marketing Flyer campaign is a great business building technique, and can help you build your business and brand pretty quickly. Flyers are versatile, relatively inexpensive and can be used in a variety of ways and for almost any purpose. Some agents use them when they get new listings. Their routine is to get a listing, make up flyers and place them in the listings/homes so that potential buyers will have something by which to remember their listings. Agents also mail real estate flyers out to prospective buyers to announce new listings. You can do this, too but you should go a step further. As a matter of practice you should send flyers to other agents whenever you get a new listing. Get a listing, send a flyer. When you get a listing they should get a flyer. It's pretty repetitive, but repetition is key in establishing rapport with prospects. 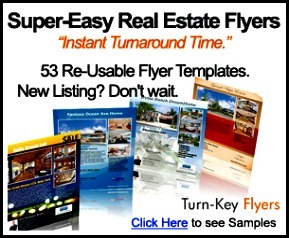 You should also ocassionally send other Realtors a "master flyer", if you will, from with all of your listings on it. After all, they have prospective buyers, and if you're not marketing to them you're missing the boat and the ship is sailing without you. You 'll be recognized by your peers as a "listing agent"
You can use a one flyer fits all approach and post, distribute, handout, fax, email or snail mail your real estate marketing flyer to your target audience. Or, you can tweak them to better target a specific population; like tenants, condo owners, move up buyers, 1st time buyers, etc. Nowadays you can purchase software to make a real estate marketing flyer from your own computer that will look as good as any job done by a professional printer. Or, you can still go to Kinko's, Office Depot or wherever else you go to have them made. I prefer the software approach myself, because for a one time purchase fee you get to make and print as many flyers as you want, whenever you want. There's tremendous value in distributing information via marketing mailers, postcards, flyers and brochures to local home and commercial shoppers. And although automated systems like call back services, real estate marketing web sites, auto responders and the like may be "sexier", marketing via real estate postcards, mailers and flyers is still standard practice for many successful real estate agents. . Holidays are great times to touch base with present and old clients. Send Thank You cards, Thanksgiving cards, Happy Holidays cards, Happy New Year cards, etc. And be sure to personally sign all of them! Real estate marketing flyers and postcards can really make customers feel appreciated, and will go a long way in establishing long term relationships with them for referred and repeat business. use a real estate marketing flyer like your Business Card; include your email address, phone number and website address. Always include information that makes it easy for someone to get in touch with you. use your real estate marketing flyers to Announce New Listings. For example, announce your $2 million dollar listing to a $750,000.00 neighborhood. Heck, it doesn't even have to be your listing, and you can still implement this idea. Can you see getting a sale this way? A real estate marketing flyer campaign is a great way to build your brand, promote your services, generate prospects and make sales. The sooner you begin the sooner you'll experience and appreciate the difference it makes in your marketing results.